A ketogenic diet (also known as the keto diet) is typically lower in carbohydrates and higher in fats than a standard American diet. Once your body adapts to a ketogenic diet, it switches from primarily using carbohydrates and glucose to fat and ketones as fuel. This adaptation within the body increases fat breakdown and oxidation, which can improve body composition, general health, performance, and perhaps even longevity! The amount of fat, carbohydrates, and protein needed to achieve a well-formulated ketogenic diet differs from person to person and is goal-dependent. Any dietary protocol in which you are lowering carbohydrates sufficiently enough to induce a state of ketosis can be considered a ketogenic diet. However, throughout this guide you will begin to understand how to construct a well-formulated ketogenic diet to meet your goals. While a ketogenic diet is also low in carbohydrates, it is NOT synonymous with traditional low-carbohydrate diets seen in popular media or even some scientific research. Since there is no strict definition of a “low carbohydrate diet,” some research studies utilize 3040% carbohydrate diets and indicate that they are “low-carb.” However we now know that is roughly the same percentage as a standard American diet that has plagued our society with obesity and metabolic syndrome. Thus, while lowering carbohydrate intake in general is beneficial, it must be reinforced that traditional low-carbohydrate diets DIFFER from a well-formulated ketogenic diet. 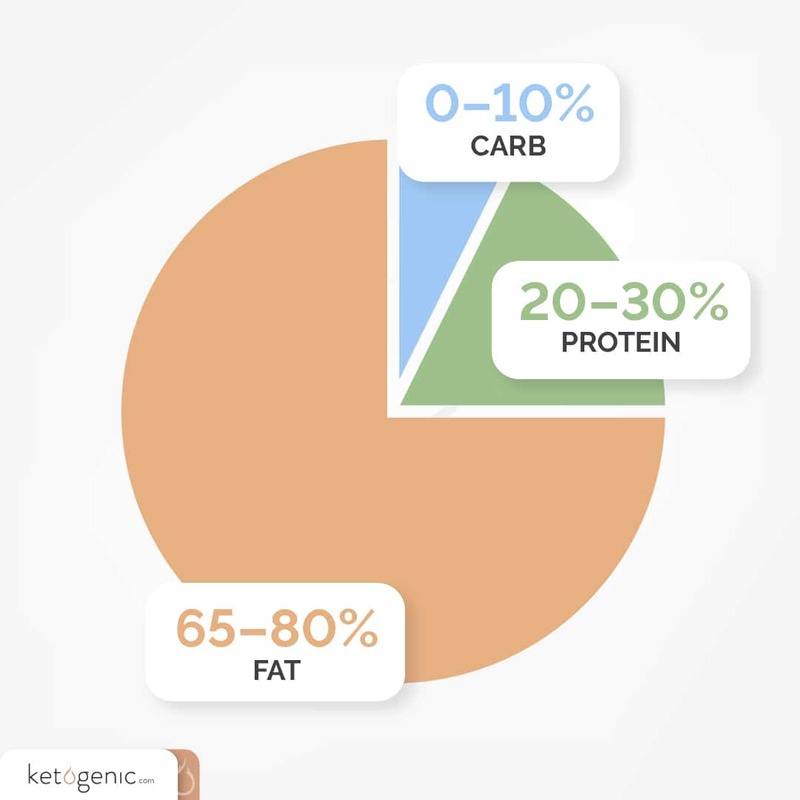 In most cases, the macronutrient profile for a ketogenic diet consists of about 510% carbohydrates, 1525% protein, and the remaining 6580% from fat. By restricting glucogenic substrates (i.e. 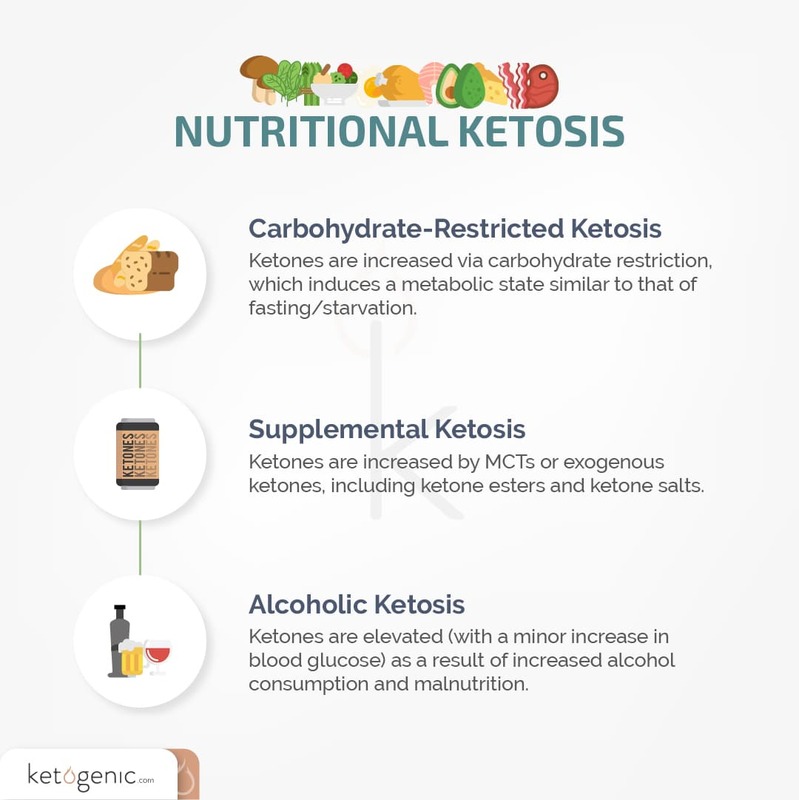 nutrients that increase blood glucose levels, like carbohydrates and glucogenic amino acids from proteins), a deeper level of ketosis can be achieved, which may have a plethora of benefits as discussed below. As an example, one study compared diets with 30, 60, and 100 grams of carbohydrates per day and found that restricting carbohydrates to 30 grams led to a greater increase in circulating ketone levels and body fat loss. The Atkins diet and ketogenic diet are often used synonymously; however, they are different. While both diets lower carbohydrate consumption, the Atkins diet allows for a period in which both protein and carbohydrate intakes are increased (while fat intake is lowered) beyond what would classify as ketogenic. The goal of the ketogenic diet is to shift the body into utilizing fat/ketones as its primary fuel source. By doing so, the body creates a metabolic substrate called ketone bodies. However, due to the increase of both carbohydrates and protein as well as lowered intake of fat, the Atkins diet is metabolically different from a ketogenic diet and often does not result in a consistent state of ketosis. In addition to the traditional ketogenic and Atkins diets described above, there are modifications that can be implemented to both of these diets in order to produce greater benefits on an individual basis. One such amendment, called the Modified Atkins Diet (MAD), is structured similarly to the Atkins diet where protein and fat are consumed freely but carbohydrate intake is further restricted, providing an intermediary diet between Atkins and ketogenic diet. This approach is commonly being used with great success among children with epilepsy due to its ability to increase the likelihood of adherence to the diet while still minimizing glucose intake from dietary carbohydrates. There exists great debate on how to quantify the macronutrient ratios and percentages for a traditional ketogenic diet. Despite numerous opinions, the common and ultimate objective is to develop a diet that is sustainable in achieving the desired outcome (i.e., a state of ketosis). As such, while it is suggested that 6580% of the total calories come from fat, and 1530% from protein, these numbers will be optimized according to every individual’s unique metabolic needs. For example, an individual who is trying to achieve a state of ketosis might have a different ratio of macronutrient requirements than someone who is using a ketogenic diet to improve their body composition. 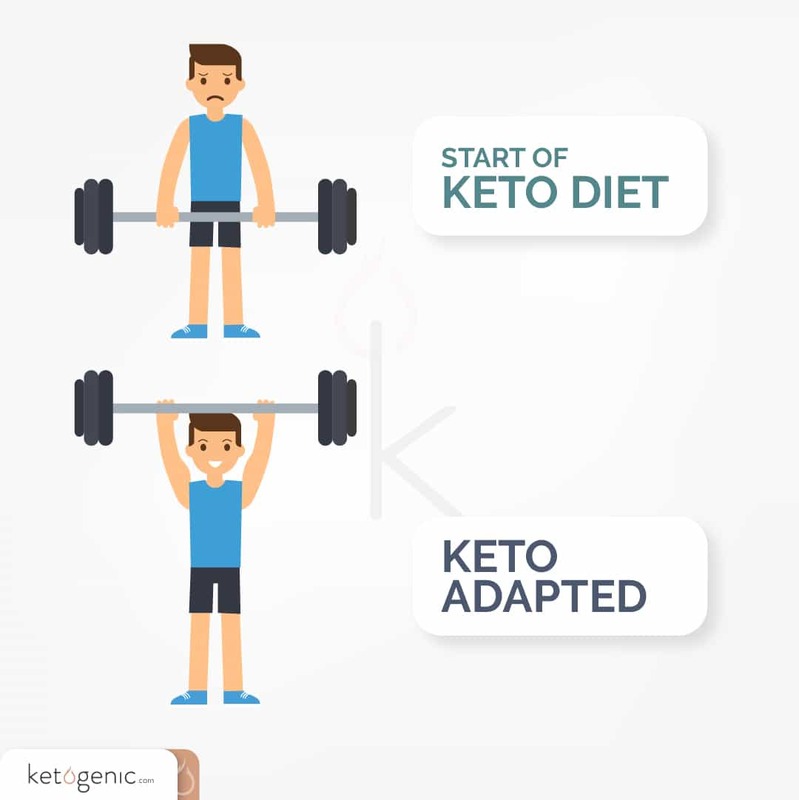 Once the body begins to use fat as its primary fuel source, metabolic “keto-adaptation” characterized by increased production of ketones takes place. It is important to note that there is no “optimal” level of ketosis, nor is there a standard macronutrient profile to achieve a ketogenic state, because factors such as activity level, body composition, and desired health and performance outcomes will influence these variables. 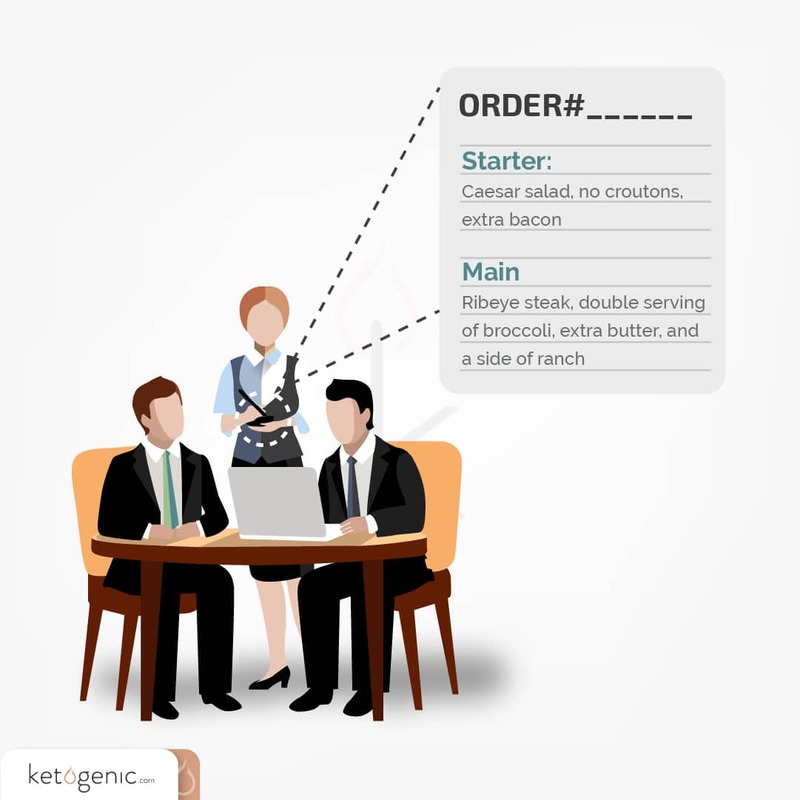 Although individualized, Ketogenic.com currently offers a Keto Calculator that can help provide you with a starting point on your macronutrients. Keep in mind that this is just an example and certainly will be different for every person depending on his or her goals and biology. Increased Energy: Fat and ketone bodies can be utilized as a fuel source for nearly all of the cells in the body. Once the body begins to use ketones as its primary fuel source, there will be a noticeable increase in energy since you are avoiding the ups and downs associated with high-carbohydrate/high-glucose/high-insulin levels that result in feeling lethargic and tired throughout the day. Cognitive Enhancement: Ketones may be the preferred fuel source for the brain. Due to the brain’s preference to uptake and utilize ketones as fuel it is very common for individuals to report an increase in cognitive performance. This is even more common in individuals with some degree of insulin resistance, as their brain is likely unable to effectively utilize glucose as a sole fuel source due to the resistance. 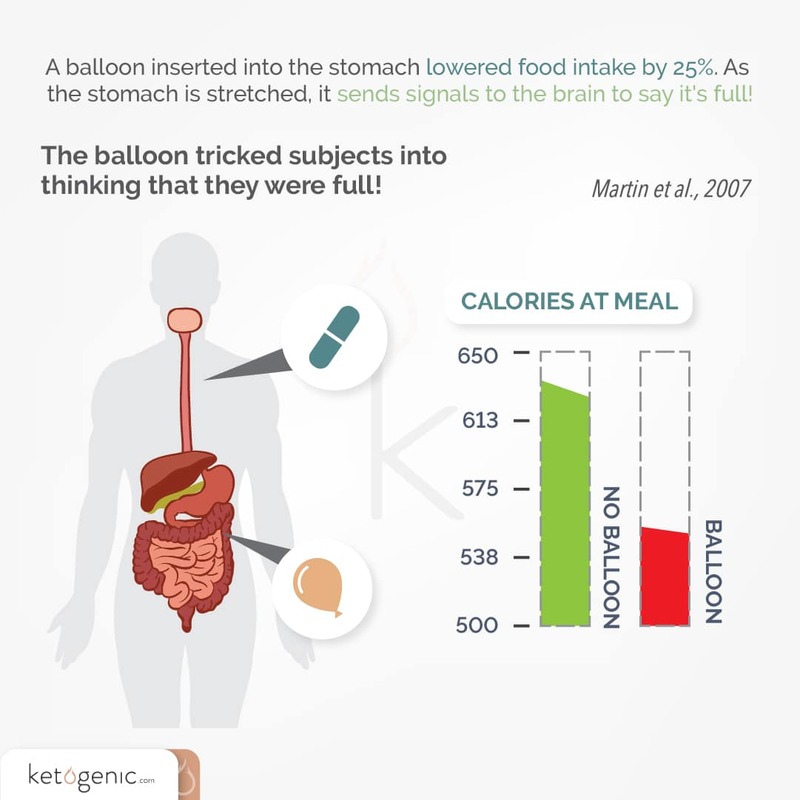 Appetite Control: The high-fat nature of the ketogenic diet along with elevated ketone and stable blood glucose levels have been shown to have a profound effect on appetite. This may give individuals who have a difficult time controlling the amount of food they eat “freedom” in knowing that they won’t be as hungry and thus less likely to consume excess calories. Additional research has shown that eating dietary fat can suppress the hormones responsible for appetite stimulation. Participants on a ketogenic diet with unrestricted caloric intake consumed fewer calories throughout the day and felt more satiated than those on a similar unrestricted low-fat diet. Body Composition: Physical changes in the body are one of the primary reasons people are attracted to and implement low-carbohydrate diets. By definition, being in a state of ketosis means you are able to tap into the body’s fat stores, metabolizing fat for immediate energy and producing ketones for fuel. Furthermore, the ketogenic diet has been shown to reduce circulating insulin levels, which may lead to less storage of fat by the hormone insulin. While both “low-carbohydrate” and ketogenic diets are effective for weight loss, studies have demonstrated that the ketogenic diet is superior. Ketogenic and low carbohydrate diets have been shown to decrease body fat percentage to a greater extent than low-fat diets. Research has found that the greater the carbohydrate restriction, the greater the percentage of fat loss. Research has shown that ketones have anti-catabolic properties for muscle-tissue, which is important for people trying to build muscle or prevent muscle loss. Some studies have even supported an increase in muscle mass when the ketogenic diet is coupled with exercise. Endurance Performance: Traditionally, endurance athletes tend to consume a high amount of carbohydrates in order to “fill up” their fuel stores (i.e. glycogen) for competitions. Thus, a diet where carbohydrates are restricted seems counter-intuitive for these individuals. 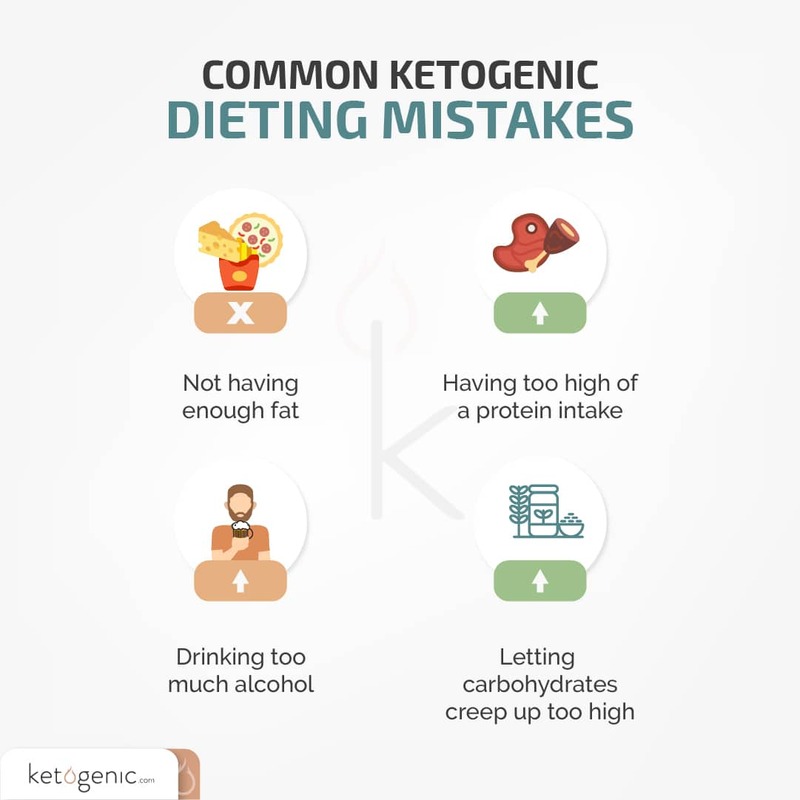 However, Dr. Jeff Volek’s research showed that once an individual is keto-adapted, not only is their performance the same or better than those consuming high levels of carbohydrates, but their glycogen “fuel stores” are the same as well. Despite consuming a diet lower in carbohydrates, these athletes are able to adapt and utilize a nearly limitless supply of fat as their primary fuel source. Therapeutics: The ketogenic diet was originally developed in the 1920s as an alternative therapeutic option to treat children suffering from drug-resistant epilepsy. Since its inception, the utilization of the ketogenic diet has expanded as a therapeutic treatment for many other conditions such as Alzheimer’s disease, Parkinson’s disease, GLUT-1 deficiency syndrome, Bipolar disorders and even cancer. For more information on Ancel Keys, check out the book The Big Fat Surprise by Nina Teicholz. When dietary carbohydrate is broken down into the energy substrate glucose, thereby raising blood glucose levels, the pancreas is stimulated to secrete insulin (the hormone that stores fat and inhibits ketone production). However, when carbohydrate intake is restricted, insulin remains suppressed, and the body’s primary fuel source shifts from glucose to fat, priming the body to enter a state of ketosis. 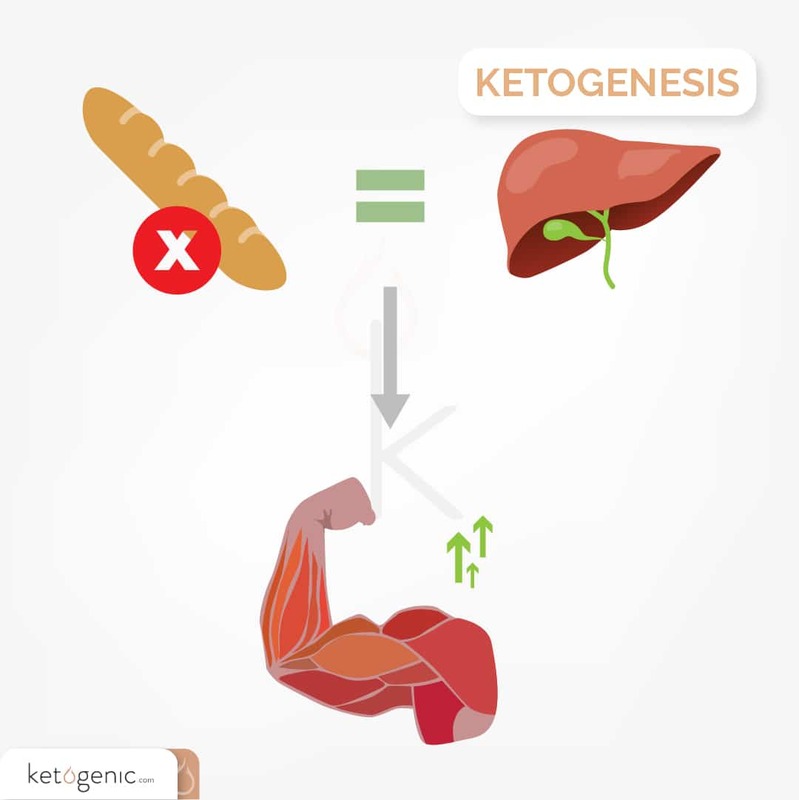 When fat oxidation/breakdown is increased to a certain extent, ketones are made in the liver through a process known as ketogenesis (i.e., keto + genesis = ketone formation). When carbohydrate intake is restricted, blood glucose and insulin levels decrease, which allows fat stores to be broken down rapidly for energy. 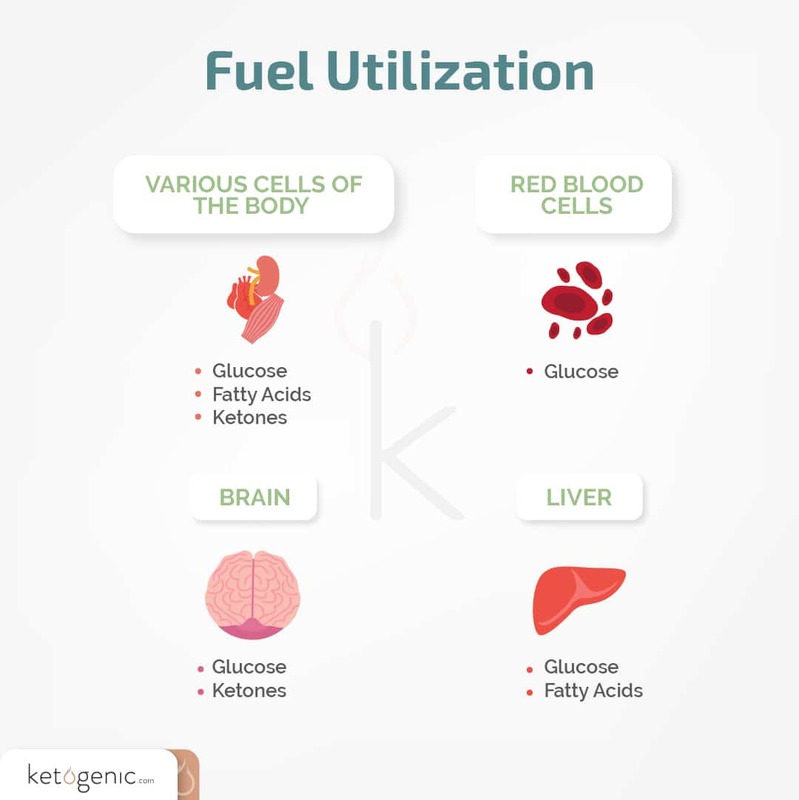 Most cells in the body can utilize either fatty acids or ketones for fuel, including the brain, which has shown to be more efficient in the presence of ketones rather than glucose. 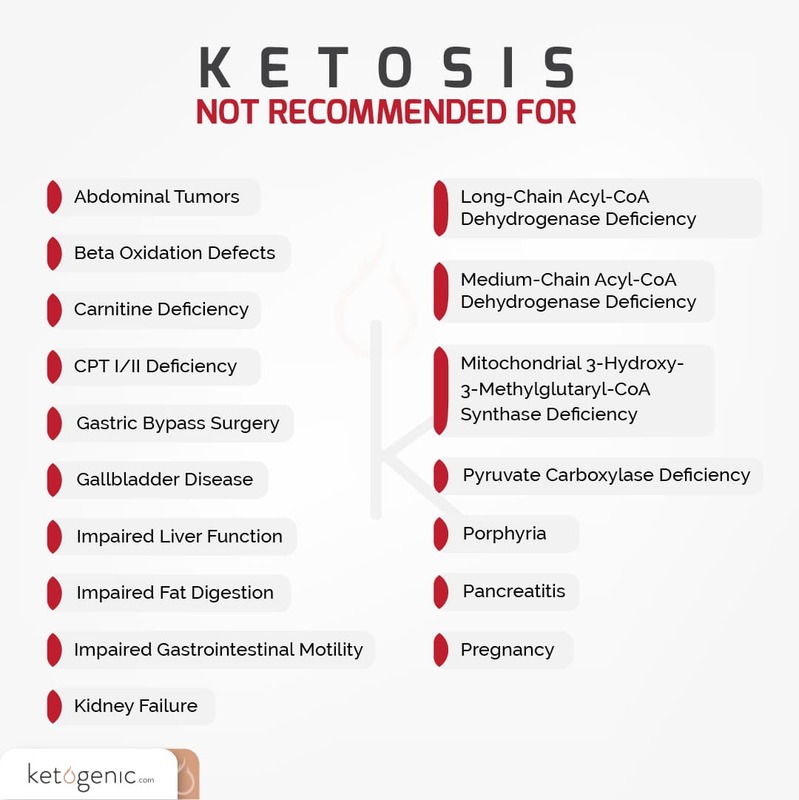 The confusion between ketosis and ketoacidosis is a prominent reason why many individuals, particularly doctors, steer clear of the ketogenic diet. It’s important to understand that these are two very DIFFERENT metabolic states. Ketoacidosis may occur in uncontrolled type 1 diabetics (DKA; diabetic ketoacidosis) due to insulin deficiencies. DKA is associated with both elevated blood glucose and ketone levels; due to little to no insulin production, blood glucose cannot enter insulin-dependent cells to be used for energy, and as such, cells become hungry, resulting in uncontrolled ketone production. In turn, a highly acidic environment is created that can have detrimental effects on an individual’s health, possibly resulting in death. It must be echoed that the ketogenic diet, which induces “nutritional” ketosis, is vastly different and should never be confused with DKA. 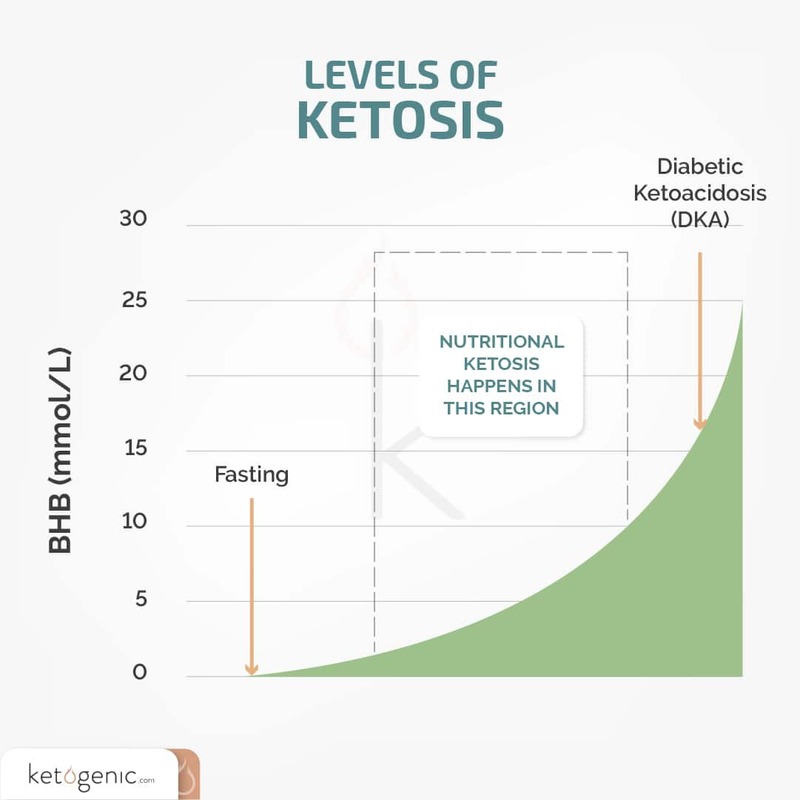 To put this in perspective, a normal state of ketosis, as achieved via the ketogenic diet may elevate ketones anywhere from 0.35mM, while DKA results in ketone levels of about 15mM or higher. Once “keto-adapted,” many tissues increase their capacity to utilize ketones for fuel. Some tissues even prefer to use ketones for their cellular energy needs. For instance, the heart, as well as many areas of the brain, prefers to use ketone bodies as opposed to glucose. One interesting fact is that Dr. Stephen Cunnane found that the uptake of ketone bodies in the brain is proportional to their production.Additional research has also demonstrated that as uptake of ketones increases, the uptake of glucose decreases in brain tissue. In contrast, there are certain cells that cannot use fatty acids or ketone bodies, and are considered “obligate glucose users.” Red blood cells and specific parts of the brain are obligate glucose users. Don’t stress, however, because even though you may not be consuming a lot of carbohydrates, these cells can obtain glucose through a biological process called gluconeogenesis (the production of glucose from other non-glucose materials). The answer to this question is often individualized and will depend on the metabolic state of each individual. One can enter a state of ketosis after an overnight fast. However, this slight elevation may not be high enough to allow for your body to efficiently utilize these ketones as a primary fuel source. Over time, as you become more adapted, your body will consistently be producing AND utilizing ketones. For some, this could take as little as one week, however, for others, it could take several weeks to accomplish. The length of time it takes to become keto-adapted also greatly depends on the composition of the ketogenic diet utilized (i.e., 20 grams versus 50 grams of carbohydrates per day) as well as personal activity level. Keto-adaptation occurs as tissues maximally increase their capacity to utilize ketone bodies for fuel. As glucose metabolism slows and fatty acid breakdown ramps up, ketones are synthesized and increasingly utilized for fuel. After a few weeks or months of increasing ketone and fat utilization, the body adapts to these new fuel sources. In addition to increased fat breakdown and ketone synthesis and utilization, keto-adaptation is associated with decreased and stabilized blood glucose levels. In order to increase uptake in your cells, your body must increase the transporters (or tunnels) that take up ketones. As you continuously build up tunnels/transporters, you will be able to take up and utilize ketones with greater efficiency. 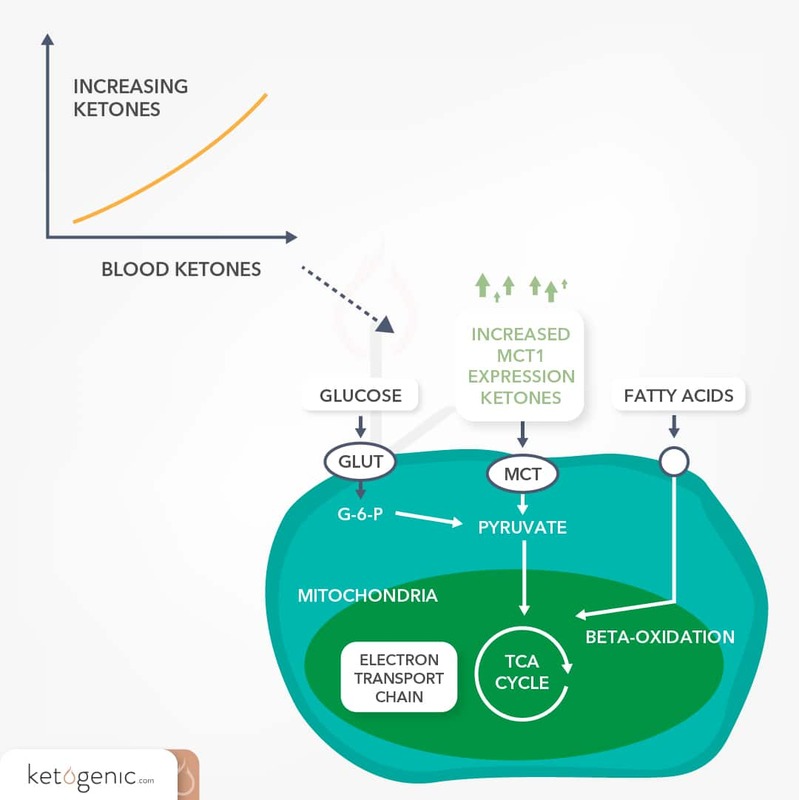 Among the many biological modifications that must occur for sufficient ketone body utilization, the upregulation of ketone transporters must take place. Thus, research has demonstrated that chronic elevations in blood ketone levels positively increase the number of these transporters. Therefore adherence, especially during the initial stages of the ketogenic diet, is critical. The “keto-flu” is a term used to define the period of discomfort that accompanies the biological changes that occur when switching the body’s primary fuel source from carbohydrates to fats. 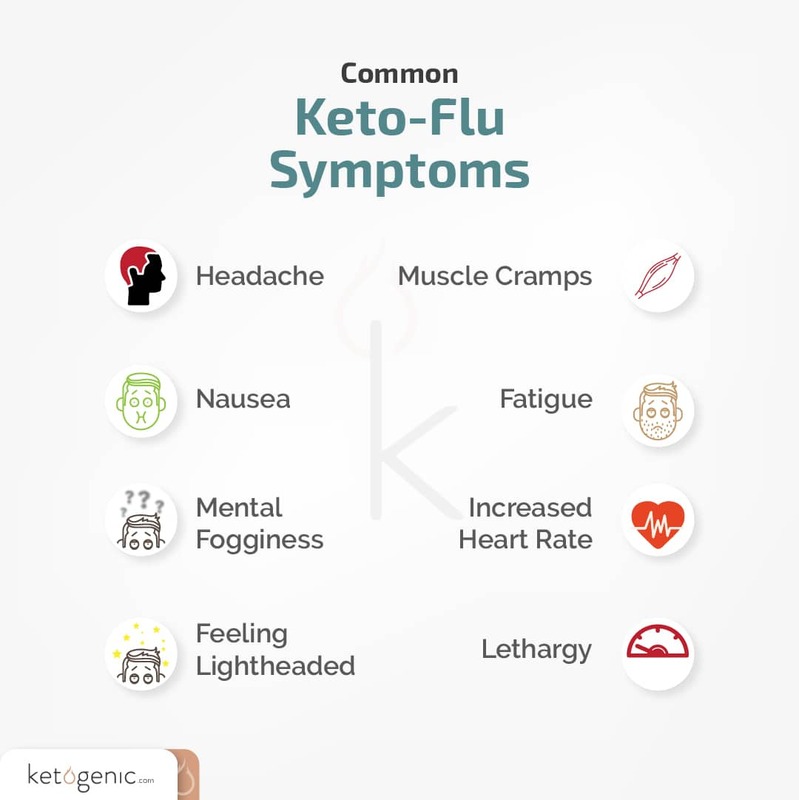 With symptoms that often feel like an illness, the “keto-flu” may be characterized by the symptoms depicted above. Again, if one’s ketogenic diet has been well formulated, many of these symptoms may not occur or can be alleviated through proper electrolyte supplementation. Research on the performance measures following the first six days of a ketogenic diet have found that performance suffers. However, an additional study found that after a month of ketogenic dieting, performance did not suffer. Therefore it may not be a great idea to start a ketogenic diet close to a competition or performance based event. Instead give yourself a couple of weeks to fully adapt. At the start of a ketogenic diet, it is not uncommon for an individual to experience rapid weight loss. This may concern some people, but it is worth noting that not ALL weight lost is body fat. When we lower our carbohydrate intake our insulin lowers, causing us to excrete more water. Additionally, reducing carbohydrate intake causes the body to break down glycogen stores (to initially maintain blood sugar levels); glycogen is the storage form of glucose that is located in our liver and skeletal muscle. The loss of both water and glycogen accounts for most of the weight loss in the first few days. Don’t be discouraged! Soon after, total body water and glycogen levels will balance out. Cravings: As one begins to eliminate carbohydrates from the diet, it is common to experience carbohydrate cravings. Several suggestions for conquering these cravings are outlined below. However, it should be noted that as the body keto-adapts, hunger and appetite should become suppressed. One interesting study found that when you increase the occupied volume inside of the stomachs of subjects, this led to feelings of perceived fullness. This means by doing things like drinking more water and eating more high volume foods we can improve our feeling of fullness. Try making a keto dessert from our recipe section! Cramps: Due to the initial release of water when starting a ketogenic diet, people often forget to replenish and hydrate. Due to this, some may experience “dry mouth.” An effective remedy is to ensure that there is sufficient consumption of water coupled with electrolyte balance. If dehydration persists, an increase in electrolytes may be needed (especially magnesium). Constipation: As mentioned above, the elimination of carbohydrates coupled with the increased release of water may lead to constipation. If this occurs, simply increasing water consumption as well as incorporating more fiber into the diet can alleviate these symptoms. Additionally, some electrolytes like magnesium can also assist with this in higher amounts. Are There Different Types of Ketosis? There are several different methods in which the body can enter the metabolic state of ketosis. Fasting ketosis: Fasting ketosis, also referred to as starvation ketosis, played a major role in the development of the ketogenic diet. The concept of fasting has been around for centuries and can be traced back to biblical times. By definition, fasting is the absence of caloric consumption for a period of time. This can range from several hours to several days and can have profound effects on the degree of ketosis. 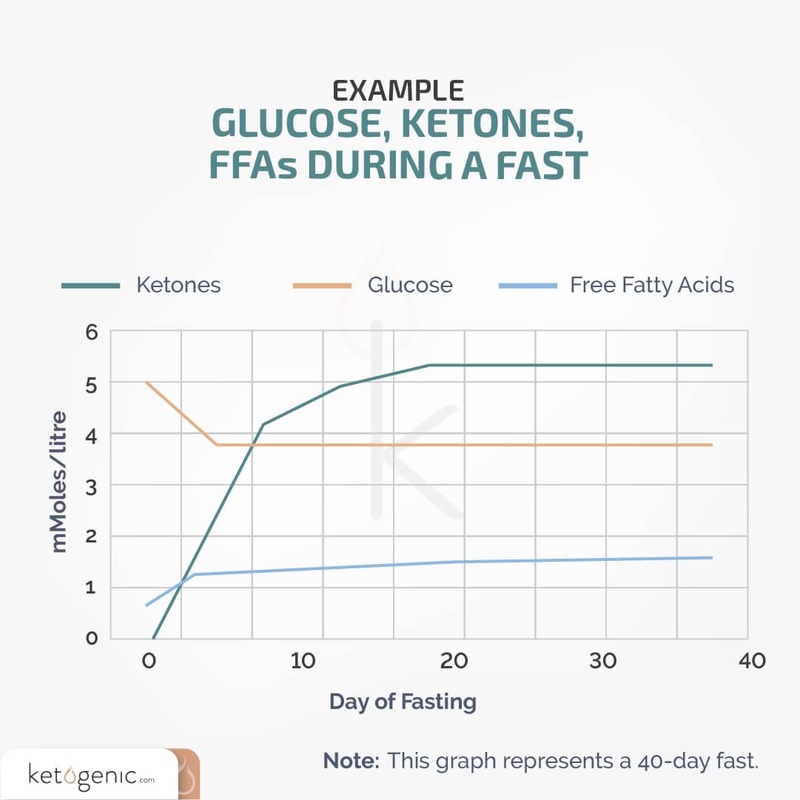 As the duration of the fasting increases, so does the production of ketones, and thus a deeper ketogenic state is obtained. 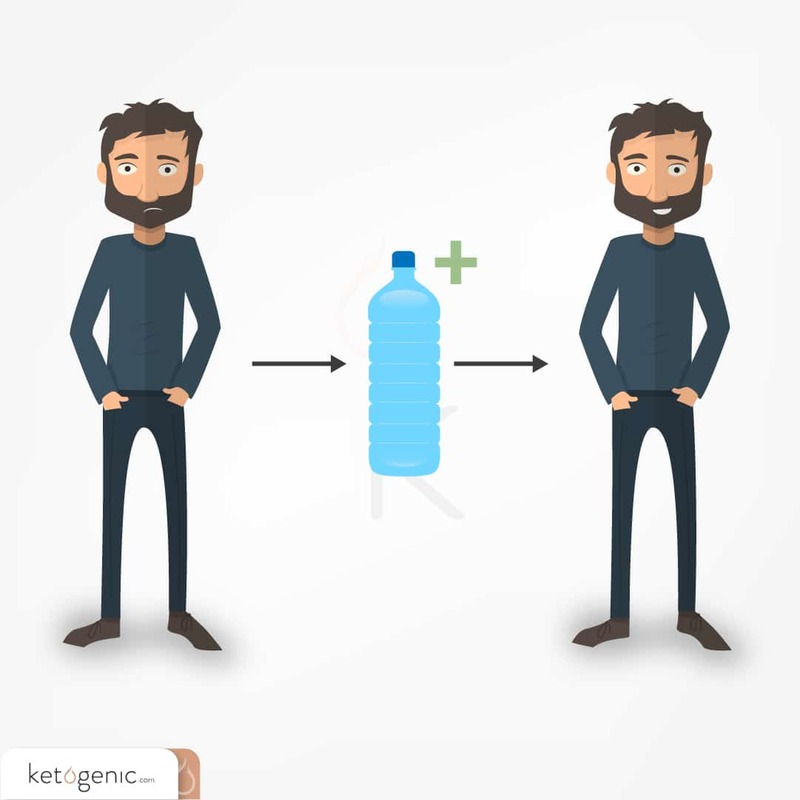 As such, the mechanisms of ketone production are similar between fasting and dietary applications similar to ketogenic diet, both of which result in lower and more stable levels of insulin and blood glucose accompanied by fat metabolism. A monumental study by George Cahill found that as fasting time increases, the level of ketone production also increases (eventually stabilizing). Spanning for a period of 40 days, this landmark study is a prime example of the safety of the ketogenic diet for a majority of individuals. Carbohydrate-restricted ketosis: This type of ketosis mimics the same biological alterations seen during lengthy fasts, but without the complete restriction of food. Carbohydrate-restricted ketosis is achieved primarily through a very low-carbohydrate ketogenic diet. This restriction, in turn, results in reductions of insulin and blood glucose levels similar to that of fasting, which again increases blood ketone levels. For most individuals, nutritional ketosis is much more sustainable than fasting or starvation ketosis. Fasting can still have its place in a ketogenic diet. 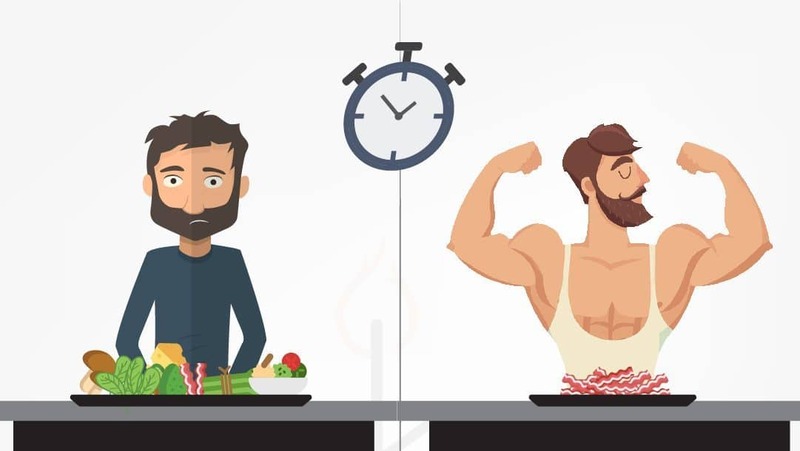 Many individuals following a ketogenic diet like to implement a regular fasting protocol such as intermittent fasting (IF) (1220 hours daily) or every-other-day fasts (EOD), depending on their goals. This practice is not critical for success on a ketogenic diet, but it can enhance the level of ketone production, and thus magnify the benefits. Supplemental ketosis: This form of ketosis has recently gained momentum in the field of ketogenic dieting. Supplemental ketosis is a ketogenic state that is achieved through the ingestion of ketogenic supplements. Consuming these substances alone does not mean that an individual is “keto-adapted.” While these products can help during the keto-adaptation period, especially if one is experiencing the “keto-flu,” they will only elicit short-term increases in blood ketone levels. 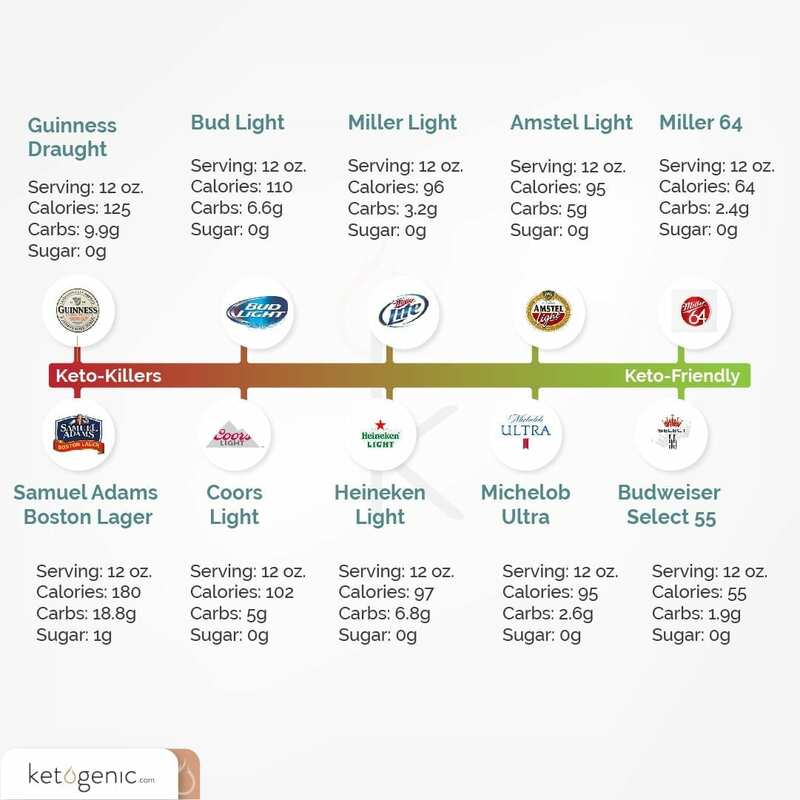 Exogenous ketones can acutely produce benefits similar to the ketogenic diet; however, these products are best used in conjunction with a well-formulated ketogenic diet, or the very at least, a diet that restricts carbohydrates. The commonly used supplements on the market are medium-chain triglyceride (MCT) oil and exogenous ketones. MCT oil is a fat that, in contrast to other longer-chain fatty acids, travels straight from the intestines to the liver where it is readily metabolized. This allows for ketone production in the liver to occur faster than with other fats (long-chain fatty acids have to travel through the lymph and circulatory systems first). Exogenous ketones are synthetic substances that mimic the ketones produced in our body (endogenous ketones). Exogenous ketones can come in the form of ketone salts or ketone esters. 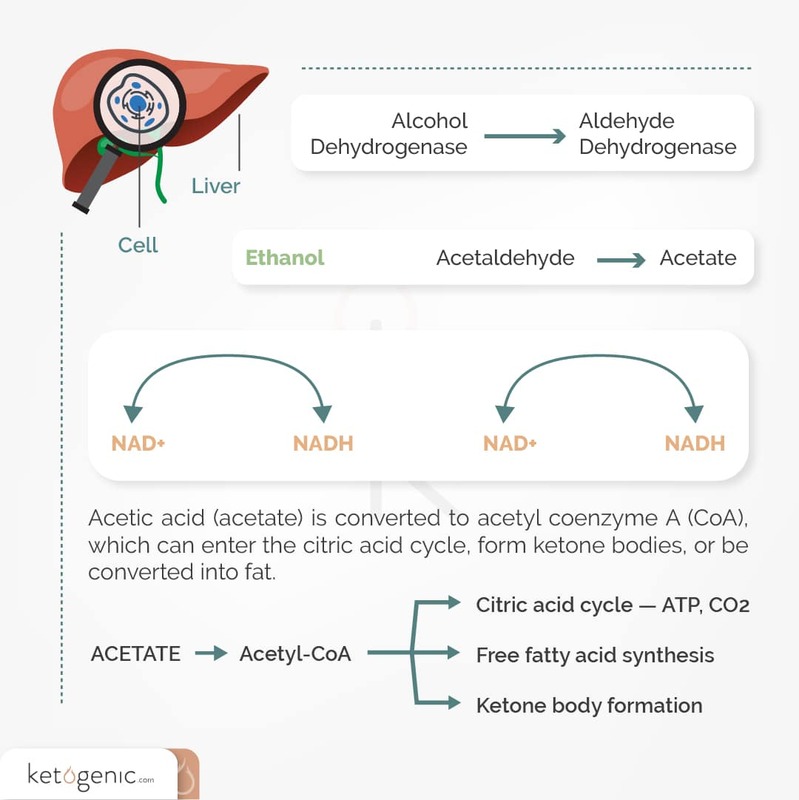 Alcoholic ketoacidosis (AKA): AKA is a ketone-producing state that may occur following excessive alcohol consumption for long periods of time. When alcohol is metabolized in the liver, ketones are produced. Furthermore, as with other ketogenic states, certain biological changes, specifically at the hormonal level, occur to promote fat metabolism and ketone production. It is critical to note that AKA will not occur if the alcohol consumption is coupled with sugar. 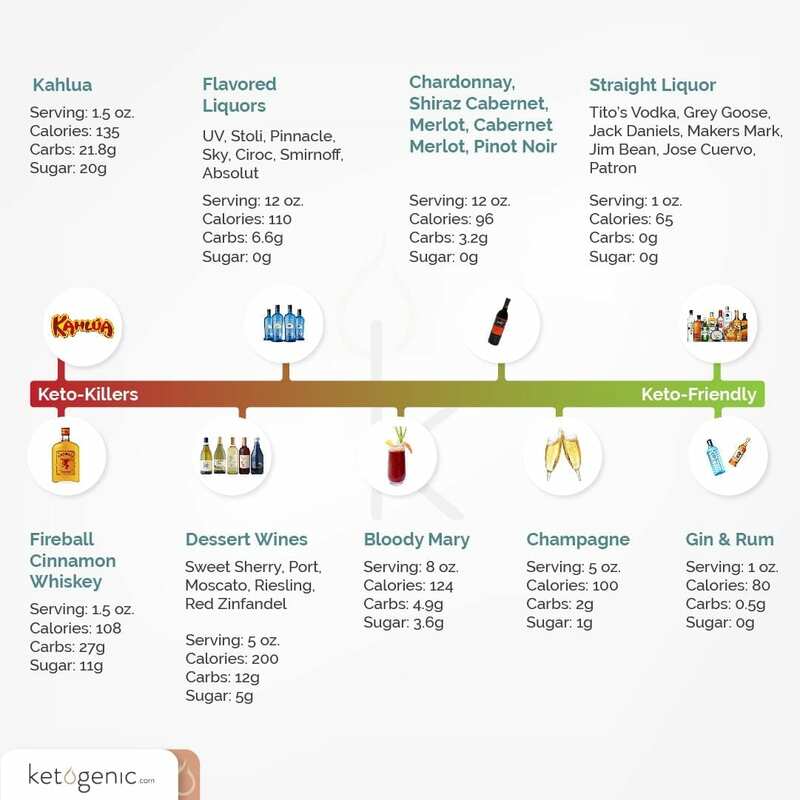 Note: Ketogenic.com does NOT recommend or promote the consumption of alcohol to produce or augment a ketogenic state. Diabetic Ketoacidosis: Diabetic ketoacidosis (DKA) is the variation of ketosis that is responsible for deterring society from considering the adoption of a ketogenic diet. DKA occurs primarily in those suffering from Type 1 diabetes. The inability to secrete insulin prevents ingested carbohydrates (glucose) from entering our insulin-dependent cells (i.e., muscle and adipose tissue) as a substrate for energy production. Due to this induced cellular starvation, the body will begin to produce ketones at an uncontrolled rate. Detrimentally, this results in high levels of both ketones and glucose. Extremely high ketone levels in the blood will elicit a dangerous biological environment that can even result in death. It must be clarified that DKA is very different than nutritional ketosis or fasting ketosis; ketone levels cannot be produced at such high levels in healthy individuals as they are with those in DKA. Breath Ketone Analysis: This method analyzes an individual’s breath to determine whether or not they are producing ketones, specifically, acetone. While this method has also been found to be an effective indicator, more research needs to be done to examine how this compares to blood testing. Studies investigating breath analyzers have found that these devices serve as a reliable indicator of ketosis. Blood Ketone Meter: Measuring ketone levels in the blood more accurately measures and indicates an individual’s metabolic state of ketosis. 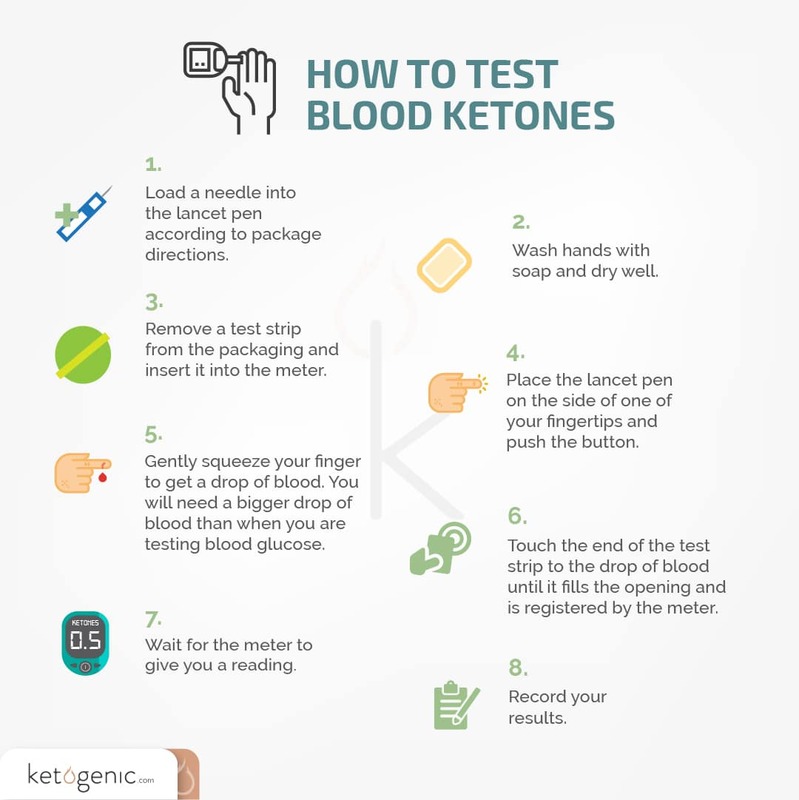 Similar to measuring blood glucose levels, this method also uses a blood meter and a chemo-sensitive strip made specifically to measure ketones in the blood called betahydroxybutyrate (HB). As with blood glucose measurements, a blood sample can be acquired from a finger prick. The ketone level displays on the meter within a few seconds of a sample placement on the strip. As with other facets of the ketogenic diet, the optimal ketone levels will vary on an individual basis. However, literature typically suggests that mild nutritional ketosis will begin once blood ketones are around 0.30.5 mmol/L. Upon “keto-adaptation,” this value may increase to around 1.03.0 mmol/L; however, that’s not always necessarily the case. If an individual is following a ketogenic diet strictly for therapeutic reasons, one may consider trying to achieve a deeper level of ketosis, but even those with a strict regimen may see only slight elevations in ketones due to rapid uptake into tissues. 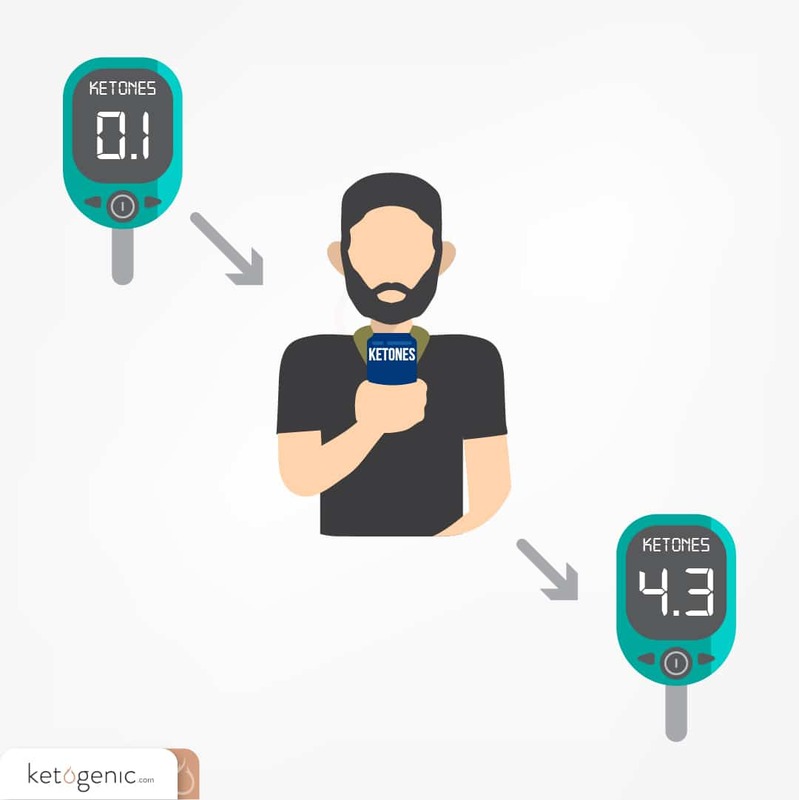 Testing ketones may be a good way to initially determine one’s metabolic state of ketosis; however, as mentioned above, since the “optimal” level of ketones varies among individuals, daily ketone testing is not necessary. There are several strategies for transitioning into a ketogenic state. Depending on a variety of factors and lifestyle habits, some individuals choose to ease into the process by adopting a low carbohydrate diet prior to implementing a full ketogenic diet. One place to start would be to eliminate sugary, processed foods and replace those with whole, lower-carbohydrate foods. In doing so, you will begin to understand the ketogenic diet, and once ready, you can dive into and customize the diet. To aid in the transition of a ketogenic lifestyle, our “Keto Calculator“ is an excellent resource! Cut the “healthy” carbs: Even the carbohydrate-containing foods that are considered to be healthy should be eliminated on a ketogenic diet, including but not limited to: most fruit (bananas, apples, etc. ), rice, pasta, quinoa, sweet potatoes, non-fat yogurt, whole grain products, granola, oatmeal, and sports drinks. Stick to high-quality protein, fatty cuts of meat, healthy fats, and high-fiber cruciferous vegetables, while also drinking plenty of water. These are staples of a well-formulated ketogenic diet. Tip: When shopping, become accustomed to reading nutrition labels, paying careful attention to “sneaky carbohydrates” that may be included in dressings, sauces, and dips, which can add up quickly and knock individuals out of ketosis. Too many “sneaky” carbohydrates: Those who do not track may end up exceeding the 2050g, or around 510%, which is traditionally recommended. Keep in mind that things like ranch dressing and peanut butters need to be used sparingly despite being “high fat” because they also tend to have high carbohydrate levels as well. Not having enough fat: People restrict their carbohydrates but fail to increase their fat intake. Now this doesn’t mean you need to drink oils and put butters in your coffee all of the time, but make sure you are using fat to fill in your calories once protein is accounted for. Having too much protein: This is likely not an issue for most people, but for others having too much protein can negatively impact ketosis, due to its glucogenic effects. The level needed to achieve this is still unknown, but likely higher than we originally thought. To prevent this, try to eat whole foods as much as possible instead of isolated protein sources (i.e., straight protein shakes). Drinking too much alcohol: Certain alcohols may be tolerated in moderation by individuals while remaining in a ketogenic state. However, consuming too many alcoholic beverages, which are often high in carbohydrates, can prevent one from achieving or knock one out of a ketogenic state. Fiber: Adequate fiber ensures that you have proper digestive function and may aid in the prevention of constipation. Water: As mentioned above, you can rapidly excrete out water on a ketogenic diet. To prevent dehydration, consumption of more water than one is typically accustomed to will be necessary. If an individual experiences lightheadedness, brain fog, constipation, or headaches, dehydration may be the culprit. Electrolytes: Due to the increased water expulsion by the kidneys, many electrolytes are simultaneously lost. Electrolyte imbalances are heavily responsible for feeling the “keto-flu.” Important electrolytes one must consider replacing: sodium, potassium, and magnesium. These electrolytes can be replenished by increasing your intake of certain foods and/or supplementation. Choose a Protein Source: Typically, it’s easier to choose a fattier protein source such as red meat, eggs, salmon, or chicken thighs. However, leaner meats will likely still work; fat will just have to be added elsewhere. Add High-Fiber Vegetables: Selection preference is given to cruciferous, dark leafy greens. Salads following the suggested criteria for a well-formulated ketogenic diet are always an excellent option. Top with Fat: In order to fill in the rest of our calories, you can add in fat on a ketogenic diet (i.e. butter on top of a steak). This macronutrient can be achieved through the incorporation of full-fat salad dressings, butter, or oils (e.g., coconut, olive oil), full-fat cheeses (in moderation) and lower carbohydrate nuts. Dessert: Fat bombs, cheesecake, low-carb cookies, and keto peanut butter cups. Using the tips below, maintaining a ketogenic lifestyle while dining out can be stress-free. Assess the menu options ahead of time. Ask questions! Ask your server how specific dishes are prepared (sauces, dressings, seasonings, etc.). When in doubt, keep it simple by ordering a meat of choice with veggies/side salad. Top with a full-fat dressing, butter, or oils. 1. Electrolytes: To reiterate, maintaining electrolyte balances is critical on a ketogenic diet, in order to prevent side effects and the “keto-flu.” While this can be done exclusively through whole foods, some individuals may require additional sources. Sodium, magnesium, potassium, and in some cases, calcium, can all be replenished via supplementation. 2. Caffeine: Caffeine can be a useful supplement during the “keto-adaptation” process, as lethargy is a common side effect. Additionally, studies have shown that caffeine may promote ketogenesis. 3. Medium-Chain Triglyceride (MCT) Oil: As the primary fat composition in coconut oil, and due to its bio-availability, MCT oil can contribute to ketone production while serving as a reliable energy source. 4. Fiber: As with electrolytes, fiber can be acquired exclusively through food. For those individuals who do not prefer eating a lot of vegetables, a fiber supplement can be considered. 5. Vitamin D3: Vitamin D can be supplemented but is also found in many foods allowed on a ketogenic diet, including fatty fish, beef liver, cheese, and egg yolks. 6. Greens Supplements: To ensure micronutrient levels are sufficient and balanced, some individuals may consider incorporating a green supplement; however, it is critical that the supplement is low in carbohydrates. 7. Fish Oil: Fish oil is an excellent addition to any healthy diet, especially a diet that is lacking in Omega-3 fatty acids. Research investigating the effects of fish oil supplementation on a ketogenic diet demonstrated greater reductions in triglyceride levels when compared to a ketogenic diet without supplementation. It is important to note that consuming these supplements does not mean that an individual is “keto-adapted.” While these products can acutely put one’s body into a state of ketosis, which may alleviate “keto-flu” symptoms for some, most individuals use ketone supplements in conjunction with a ketogenic or low-carbohydrate diet. Tip: Consuming a moderate dose of exogenous ketones during the initial “keto-adaptation” period could potentially accelerate the “adaptation,” while at a minimum increasing energy production. Once one is adapted, these products are excellent for achieving higher blood-ketone levels, which, in turn, can be beneficial for athletic and cognitive performance, energy production, and perhaps more effective therapeutic treatment. Blood Lipids on a Ketogenic Diet: Lack of proper education has incorrectly held a high-fat diet responsible for an increase in blood lipids. Decades of research, combined with efforts to shift the paradigm, are now revealing that increased dietary fat consumption does not directly result in increased blood lipids. It is actually carbohydrate consumption that tends to increase total cholesterol with noticeable decreases in the HDL “good” cholesterol. Often, researchers use a “high-fat diet” interchangeably with a “Western diet;” many confuse the term “high-fat diet” in the research with a ketogenic diet. A “high-fat diet” in the research indicates a diet with both high-fats and high-carbs, which is associated with increased blood lipids, whereas a ketogenic diet is not. Consuming under 20g of carbohydrates/day compared to a low-fat, high-carbohydrate diet led to 4x increase in HDL concentration. A 12-week low carbohydrate diet led to 10% decrease in LDL, a 5% increase in LDL particle size, and a 19% decrease in total VLDL particles (*Smaller LDL particle size is associated with higher risk of developing atherosclerosis compared to larger LDL particles). Six months on a ketogenic diet led to an 11% decrease in LDL. For more information on LDL and the lack of association with CVD, check out this review paper. Keto for Diabetes: The ketogenic diet can be an extremely effective therapeutic treatment for diabetes. Since type 2 diabetes is hallmarked by insulin resistance, a ketogenic diet may improve insulin-resistance, associated pathological state via the following: 1) lowering and stabilizing both blood glucose and insulin levels, 2) improving insulin sensitivity, and 3) providing an alternative fuel source through ketone production. Virta Health recently published a report showing patients could rapidly improve glycemic control through reductions in fasting blood glucose, HbA1c, and medication use after 10 weeks of treatment. Patients lost 7% of their body weight on average and reported less hunger. For more information, please visit our friends at Virta Health who are actively working with diabetics (https://www.virtahealth.com). An unrestricted ketogenic diet led to incidental caloric-restriction, improved insulin sensitivity, and reduced serum glucose levels, in addition to a reduction in HbA1c. Ketogenic diet led to a reduction in body weight, HbA1c, triglycerides, and dependency on diabetic medication. Keto for Epilepsy: The ketogenic diet originated in the 1920s as an effective treatment for children suffering from drug-resistant epilepsy. Since then, its highly successful applications have expanded to treat adult epileptic patients as well. This was an important progression in treatment because, despite the introduction of anticonvulsant drugs in the 1930s, at least one third of patients suffering from epileptic seizures are still fully resistant to anticonvulsant drug therapy. Early studies found that, when placed on a ketogenic diet, 12% of children suffering from epileptic seizures experienced full remission and 42% saw a reduction in seizures. In pediatric patients whose seizures could not be treated with these anti-epileptic drugs, a ketogenic diet was able to reduce seizures by more than 50% in 54% of the young patients tested, with 10% of the cohort becoming seizure-free after one year on the diet. Since this study, numerous additional studies have shown this modality to be effective for children and adults with epilepsy. Results of ketogenic dietdriven studies have included 55% of patients seeing a reduction in seizures by more than 50%, and 27% of patients seeing a 90% or greater reduction in seizures with many entering into complete remission. Keto for Cancer: Cancer is now being discussed as primarily a metabolic disease in which glucose can fuel its progression. Due to recent light shed on this subject, intensive investigations are underway and have begun to reveal that restricting carbohydrate intake can slow oncogenesis and that a full ketogenic-state may elicit even greater therapeutic benefits. Furthermore, research also suggests that fasting and the state of ketosis may increase the sensitivity of cancer cells to radiation and chemotherapy. Ketogenic diet can reduce tumor growth and prolong survival in mice. Ketogenic diet reduced tumor growth and prolonged survival. Stable or partial remission occurred after 28 days on keto. Ketogenic diet reduced glucose uptake in cancer cells. Ketogenic diet + radiation = greater survival rate and slower tumor growth compared to radiation alone. Keto for Alzheimer’s Disease: One characteristic of Alzheimer’s disease is insulin resistance in the brain (hence why it’s now being referred to as type III diabetes), which robs this critical tissue of energy. Limiting glucose while introducing ketones may be an effective mechanism for replenishing the energy in the tissue. The higher level of ketone production accompanied with a ketogenic diet is another example as to why this diet is superior to one that simply restricts carbohydrate intake. Additionally, Alzheimer’s disease is characterized by beta-amyloid deposition, which may also be mitigated by the implementation of a ketogenic diet. Ketone uptake and utilization is not impaired in those with Alzheimer’s. 25% reduction in amyloid deposition in mice following a ketogenic diet. Ketosis led to improvements on the Alzheimer’s Disease Assessment Scale-Cognitive subscale (ADAS-Cog). Keto for Parkinson’s Disease: Parkinson’s disease develops as a result of neuron death in the midbrain and is typically accompanied by tremors, as well as physical and cognitive impairments. Due to its neuroprotective effects, the ketogenic diet may help protect neurons, increase energy production and mitochondrial function, lower inflammation, and improve motor function—all of which play a role in Parkinson’s disease. For example, one study with five patients diagnosed with Parkinson’s disease who adopted a ketogenic diet saw a 43.4% reduction in the Unified Parkinson Disease Rating Scale. Keto and Traumatic Brain Injury (TBI): Research involving TBI has found that upon immediate trauma to the head, the brain takes up massive amounts of glucose. However, soon thereafter, the brain becomes resistant to taking up and utilizing glucose. This damage leads to insulin resistance and inflammation of brain tissue. The anti-oxidative and anti-inflammatory properties of ketones have been shown to not only reduce inflammation but to reduce glucose uptake in the brain as well. The ketogenic diet may also be a therapeutic treatment option for those individuals who have experienced long-term ramifications of a TBI by providing ketones as an alternative fuel source that can be readily taken up and utilized by the brain following these traumas. Injured brain can still metabolize ketones. Studies in rats on a ketogenic diet suffering a traumatic brain injury demonstrate improved cognitive performance. 1. Do I have to stay keto forever? Though it’s possible, studies have shown that once you are adapted, you could transition to eating low carb for a few days/weeks before going back to strict keto. However, it is important to understand that this flexibility should come after you are adapted and not just in the beginning. 2. What happens if I fall off the diet? If you “slip up” on a ketogenic diet, it is not the end-of-the-world nor does it mean you should continue to be off the wagon. Unfortunately, having frequent “slip-ups” or “cheat days” may prevent you from becoming “keto-adapted.” However, an occasional “slip-up” for someone who is already “keto-adapted” may not be as detrimental. Get back on track and get back in your routine. Find support groups and alternative recipes to avoid these pitfalls and setbacks. 3. Can I have alcohol? Certain alcohols, in moderation, may be well tolerated by some individuals. An example of a ketogenic-friendly red wine is Dry Farm Wines. Also, low carbohydrate beers may permit certain individuals to remain in a ketogenic state. Be sure to avoid sugary liquors and beer as well as sugar-laden mixers. 4. Do I have to count calories? Restricting your calories may be important for some individuals depending on their goals. Additionally, it may aid in the initiation of ketosis; however, not everyone will require calorie tracking to maintain a deficit. It is not uncommon for caloric-restriction to occur inadvertently as a ketogenic diet tends to be satiating, leaving individuals satisfied with fewer calories. 5. Should I implement a carbohydrate refeed? A carbohydrate refeed is not necessary on a ketogenic diet, as the keto-adapted biological and metabolic changes do not require dietary carbohydrates. There are certain circumstances, however, in which an increase in small carbohydrate influx may be beneficial; however, more research is needed on this topic, specifically with respect to variations of ketogenic diet including “cyclic” and “targeted” ketogenic diets. By definition, fasting is the absence of caloric consumption for a distinct period of time. There are several different fasting strategies: intermittent, alternate day, and even several days. Fat-fasting is the consumption of only the macronutrient “fat” during the fasting period. An example is drinking coffee all day, with fats like heavy whipping cream, butter, or coconut oil added in. Some research has shown that since this doesn’t increase insulin, it mimics a fasting state. 8. Will I lose muscle? Among the many benefits of being in a ketogenic state is muscle preservation. Research has demonstrated that ketones prevent muscle catabolism. Furthermore, muscle anabolism may actually occur once “keto-adapted.” For these reasons alone, the ketogenic diet still would allow you to maintain or increase muscle mass. 9. What are exogenous ketones? Exogenous ketones are molecules that, upon consumption, behave similarly to the endogenous ketones that the body produces due to carbohydrate restriction. At first, you may experience intense hunger; however, if your diet is well formulated, hunger tends to subside once your ketones become elevated and your blood glucose stabilizes. 11. What are medium-chain triglycerides (MCT)? MCTs are fatty acids that are structurally shorter than long-chain triglycerides, which require processing from the gallbladder. As such, MCTs are rapidly digested and directly used for energy, with a lower propensity for fat storage. These fats are a staple on the ketogenic diet, in which they can be converted to ketones! 12. Are there fats I should avoid? Not all fats are created equal! Omega-6 fatty acids, as well as “trans” fatty acids, should be limited or completely avoided if possible. Rather, one should focus on a diet rich in Omega-3 fatty acids, which have anti-inflammatory properties. Make sure you are limiting vegetable oils! 13. Should I track “net” or total carbs? 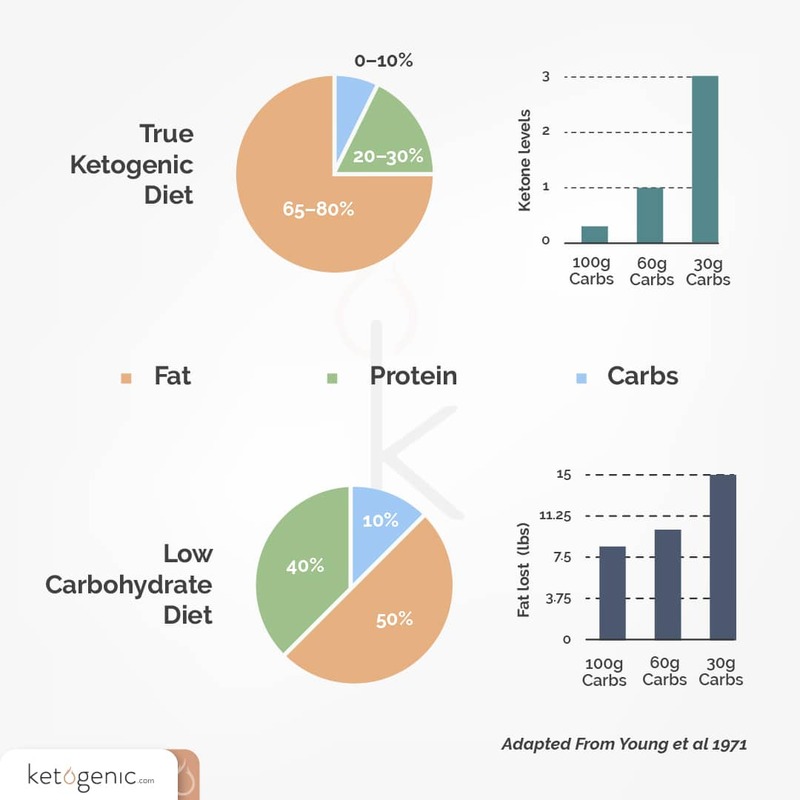 Ketogenic.com suggests tracking total carbohydrates (fiber + non-fiber carbohydrates) in the initial stages of “keto-adaptation;” however, once adapted, one may be able to track “net” carbs (non-fiber carbohydrates fiber). 14. Can I have coffee? Yes! In fact, caffeine may actually increase endogenous ketone production. However, as usual, be careful about consuming caffeine late in the afternoon, as it may affect your sleep. 15. Can I have fruit? Some fruits, such as berries, have a low glycemic index and are also lower in carbohydrates. If incorporating berries, try and opt for the fresh, organic, frozen berries. Don’t forget: avocados are the best fruit out there and well suitable for a ketogenic diet. 16. Can I have dairy? As with other customized properties of the diet, the consumption of dairy is individualized. If digestive or glycemic problems develop due to the lactose and casein in dairy, then dairy may need to be avoided. If you can tolerate it, opt for lower carbohydrate dairy like cheese, heavy whipping cream, and butter, rather than higher carbohydrate products like milk. 17. Do I need to exercise to see results? Not necessarily. Positive results can be seen on the ketogenic diet without exercise; however, exercise will maximize the benefits of the diet. In addition, exercise may help accelerate the adaptation process and allow your body to utilize ketones better. 18. Can I have as much protein as I want? Tracking protein is important for anyone who has adopted a ketogenic diet. Depending on activity level and other metabolic factors, some individuals may be able to tolerate more protein. As mentioned above, at a certain level protein can be glucogenic; so tailor it to your needs. However, we would say to lean towards more, not less, especially for older individuals trying to preserve muscle mass. 19. What do I do if I hit a plateau with fat loss? 20. Can I start a ketogenic diet if I have elevated triglycerides or cholesterol? As always, check with your physician first. Despite the high-fat nature of the diet, research has shown that the ketogenic diet may actually be beneficial for improving one’s blood lipid profile. 21. Can I have too much fat? Yes. Calories are still of importance, even on a ketogenic diet. Simply eating unlimited fat will not guarantee results. 22. How important are strict ketogenic macronutrient ratios? Depending on an individual’s current metabolic state, activity levels, and goals, macronutrient profiles will vary among individuals. In general, we recommend that a beginner adopts a macronutrient ratio around 70/25/5 (fat/protein/carbohydrate) and then customize from there. For more help, check out our Keto Calculator. 23. Which sweeteners are best on ketogenic diet? One key to the longevity of a ketogenic diet is to incorporate foods that are satisfying. If individuals choose to make keto-friendly desserts, learning which sweeteners permit one to remain in a ketogenic state is essential. Ideally, we encourage natural sweeteners like Stevia, monk fruit, erythritol, and allulose in moderate amounts. We are excited to see that there are a growing number of physicians who are implementing the ketogenic diet as a therapeutic treatment option for patients suffering from various diseases/conditions. Due to the difficulty in locating these doctors, be sure to use our “Keto Doctors“ tool to find a ketogenic doctor near you! Tag us on social media @ketogeniccom so we can stay up to date with your progress, pictures, and recipes!